Now in its 7th year, our Personal Finance Management Wintersession course kicks off January 17, 2018. The program is specifically tailored to help undergrads learn to be financially independent from their parents; build and keep a high credit score; prepare for taxes; shop for insurance; invest to build retirement savings; and create a budget and stick to it. The Colony Group, a wealth advisory firm for high net worth individuals, will lend their expertise on reducing your tax burden and financial losses. Dee Dee Chen, a Certified Financial Planner and Director of Professional Benefits at Partners HealthCare who will cover how to leverage your benefits to maximize your paycheck. Jared Sleeper, a ’14 Harvard College alum and a Venture Capitalist / Investor in early-stage companies at Matrix Partners. He previously invested in small/mid-cap technology companies at Putnam and will be here to bring you up to speed on the most important things to know about investing. Matthew Gage, a Partner Relations Specialist for GreenPath Financial Wellness, a member of the National Foundation for Credit Counseling will be sharing insights on how to ace your credit score. Students interested in taking a deep dive into their personal finance management are encouraged to attend January 17-18. 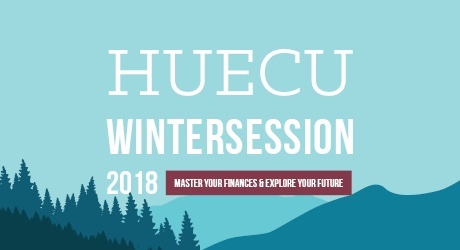 For more information, and to register visit www.huecu.org/wintersession.